If they were to move the PAC to the Tower 5 plot, then I'd like to see the space adjacent to the Freedom Tower turned into a public plaza. There needs to be an outdoor space for the workers of the towers of the WTC to sit and eat and relax outdoors. I think the memorial will be used in the same way, but it's still the memorial and a place that will be rammed with tourists year round. If they were to turn that space into a well designed, well landscaped, dynamic plaza then they can orient the Freedom Tower's main entrances to the East and West instead of along the very narrow Fulton Street. We'd like the building to open in this century, if you please. Lofter's right though, there's not going to be any more redesigns to the Freedom Tower, especially the base. Let's play with the idea of the plaza a little more. We could give Gehry two comissions. One for the PAC and the other for the Plaza. 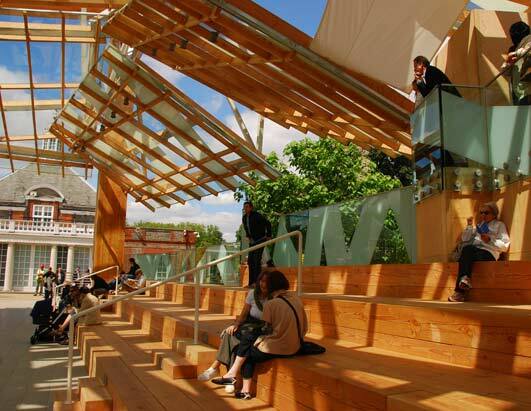 Look at what he designed for the Serpentine Gallery in London. While the deconstructed appearance of it might not be fitting for the WTC, the wow factor alone would make it a NYC landmark. Bleh ^ London can keep it. But Look! It has it's own Stairway to Nowhere ala the Survivor's Stairs!! Besides The Serpentine is an entirely different type of site (a wide open, expansive PARK) than this little space at the WTC. And we already have our Father Duffy stairway. Occupiable sculpture. Not so bad. What's so bleh? Im going with bleh. Probably one of the worst serpentine pavilions Ive seen. I like it! I think it's playful and intriguing. I really like the glass-work he's been using in his newer buildings, a la IAC and AGO. I hope that his design for the PAC includes a lot of curved glass facades. It's time for a site plan. The site isn't really all that big. I hope the center will be as innovative in opening up to the (easily pedestrianized) WTC complex as the Dee and Charles Wyly Theater, Dallas by OMA. An OMA-type plan for a Verticle Theatre composition is what is needed at the WTC -- the psace is tight and FLEXIBILLITY will be needed to serve whatever function this building ultimately is required to house. At this point no one can even honestly say what this space will be used for once it is complete (whenever that might be). Don't be surprised if the organziation(s) that have been promised space here don't end up being the ultimate tenants -- 2015 is a long way off and those arts groups can hardly be expected to become transients until then. Gehry has built but ONE performance-related spae -- the Disney Music Center in LA -- and his firm didn't work alone on the interiors. Hopefully the WTC gang has someone on board who understands acoustics (and has budgeted for same) -- not to mention other necessities that will result in a first class performance space. Given the economy this building will probably remain on hold for years to come. The space between the PAC and Tower 1 is referred to as the Plaza. Forgotten World Trade Center Arts Venue on the Move? The Performing Arts Center is the missing piece of the World Trade Center puzzle, but like a piece of experimental theater, it's about to get all up in your face. As it stands now, work on the PAC—which is supposed to be doodled by Frank Gehry, though there's no design (or money, for that matter) quite yet—can't even begin until at least 2015, when Santiago Calatrava's new PATH station is expected to open. The temporary PATH station currently sits where there PAC is supposed to go, next to the rising Freedom Tower One World Trade Center. Hey, but the Deutsche Bank Building should finally be gone by the fall, and the replacement skyscraper (aka 5 WTC) fell through, so why not build it at 130 Liberty Street? Precisely! Downtown Express reports that a proposal to do just that has started to make the rounds. The move would clear up some infrastructure headaches, and the Deutsche Bank Building's foundation can even be recycled to save money. Sounds like a great idea, which means, of course, that it's already doomed. The long-delayed Performing Arts Center at the World Trade Center site is making a comeback. A new proposal would rescue the PAC from the tangle of infrastructure in the middle of the Trade Center site and plunk it down where the Deutsche Bank building currently stands. The move would allow construction on the PAC to begin far earlier than previously contemplated. The arts center was slated to go on the north side of the site, at Vesey and Greenwich Sts. The temporary PATH entrance occupies that location now, so construction on the performing arts center there could not begin until at least 2015, when the new PATH station opens and the temporary entrance is demolished. Some fear it will take even longer. But the Deutsche Bank site could be available as soon as this winter, when the contaminated skyscraper comes down. The Deutsche Bank site was once earmarked for JPMorgan Chase, which was going to build Tower 5 there, but that deal fell through when Chase acquired Bear Stearns’ opulent Midtown headquarters toward the beginning of the financial meltdown early last year. Since then, the Port Authority has contemplated building a condo-hotel tower on the site, because demand for more offices Downtown is slim. The impetus for Silver’s meeting came partly from the Lower Manhattan Development Corp., which is working on a feasibility study about moving the PAC to Tower 5. Several people who attended the meeting said the move looked doable, because the two sites are similar in size. It is unclear whether the PAC would be a stand-alone building or whether it would go in the base of a mixed-use tower. A change to the W.T.C. site’s master plan would require approval from many parties, including the Port Authority, which owns the Trade Center site. Port Spokesperson Steve Sigmund said the Port would look into the move. Two community members who met with Port executive director Chris Ward several weeks ago said he appeared to support finding a new home for the PAC so it could open sooner. Moving the arts building could reduce the complications of building the transit center, which will also be near infrastructure related to the memorial and offices. The city has not been briefed on the potential PAC move, a spokesperson for the mayor’s office said. Silver said moving the PAC to Tower 5 has many advantages. In addition to the Tower 5 site being available sooner, the PAC could reuse the Deutsche Bank building’s foundation, saving time and money. Building the PAC on Vesey St., on the other hand, would be more difficult because of the subway running beneath it, along with the other belowground infrastructure. Saving money is important, because fundraising for the PAC has not begun and it is unclear who will raise the money. The project has received $55 million from the L.M.D.C. but will need a combination of public and private donations to get off the ground. The building’s design is also unclear. Frank Gehry is supposed to design the building, but his initial idea for a space for two arts groups was deemed too expensive several years ago, forcing one group out of the plan. Fundraising and design plans have continued to be delayed because the construction of the PAC was seen as being very far off. Silver said the only potential downside of moving the PAC is that it would leave a hole in the Trade Center site near the memorial. Michelle Breslauer, a memorial spokesperson, said it’s important to have culture at the site but she did not take a position on whether the PAC should be moved. Some renderings of the Trade Center site produced by the Port Authority have shown a grassy field in place of the arts center. Several people said L.M.D.C. chairperson Avi Schick was the one who came up with the idea to move the PAC to Tower 5, but an L.M.D.C. spokesperson declined to comment. Last year, Schick suggested moving the PAC to the Fulton Transit Center, a subway hub that was then stalled and out of money. The community did not support that idea, but there appears to be broad support for this PAC move. Menin has long suggested putting some performing arts space in one of the W.T.C. office towers, just to get the PAC off the back burner. Menin said it makes financial sense to put the PAC in the base of Tower 5, because it would save a future developer some money on the building, and the developer could buy naming rights for the center to help fund it. Joyce Theater, a Soho and Chelsea dance company, is the last remaining tenant slated for the performing arts center, after political pressures pushed out two others and then cost considerations evicted Signature Theatre . Menin would like to see other tenants added, including big names like New York City Opera, which previously tried to move into the W.T.C. A Joyce spokesperson did not return calls for comment. Silver said the proposal to move the PAC is still in its infancy, but he will hold more meetings as the details grow clearer. Michael Connolly, a Community Board 1 member who has been trying to keep the PAC in the limelight for years, was also happy with the recent progress. Where would the office space go, theres no way any of the parties involved will let the space go unbuilt.